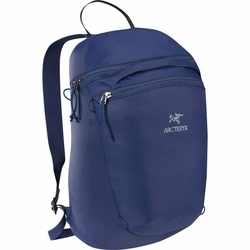 ARC'TERYX Index 15 Backpack. Inspired by summit pack design, the Index 15 Backpack is lean and simple, light and compact, and stores in its own front pocket making it an idea take along for travelers and backpackers. The top loading main compartment easily holds lunch, a rain shell or midlayer, and other small necessities. An internal stash pocket supports a hydration bladder or secures a tablet computer. Eight external loops make it possible to clip on water bottles or other small items, or to rig a bungee system to strap larger items to the outside of the pack. Handles make grab and go easy, and allow the pack to be hung up when not in use.